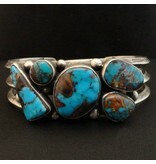 Home / 5 Stone Natural Candelaria Turquoise Bracelet by Randy and Etta Endito (Navajo). 5 Stone Natural Candelaria Turquoise Bracelet by Randy and Etta Endito (Navajo). A dramatic contrast from bright blue to dark tan is evident in these five stones of Candelaria turquoise, all of them rich with character and distinction. 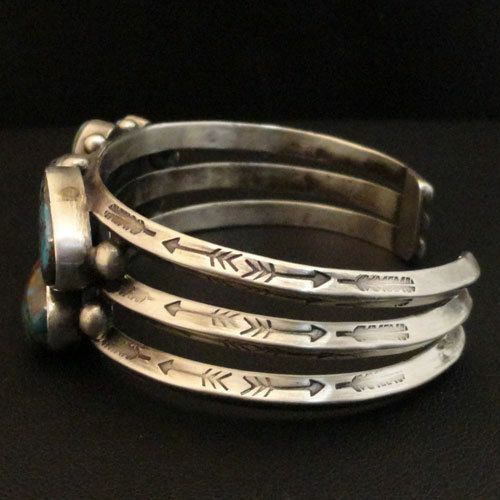 All five stones are mounted on a triple-rail shank of silver that has been lightly tooled in Native design. Click on smaller images for alternate angle views. 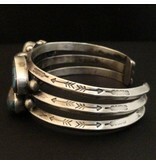 Opening of the bracelet is 1"
Stone size varies from 8mm round to 18x15mm. Bandwidth from center to the end is 7/8" to 1/2"
Click to read about Randy and Etta Endito.